Your suggestion is on its way! The 49ers are going to the Super Bowl in New Orleans. 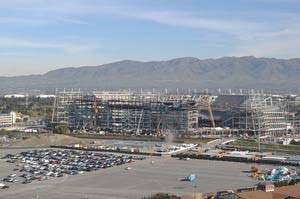 However, what's new for the 49ers is their new Santa Clara stadium that could be ready for the 2014 NFL season. The new 49ers venue, the first professional sports stadium in California to achieve net-zero energy, will become the first NFL stadium to open with LEED certification. This standard is a combined effort from building owners to introduce several sustainable technologies such as green roofs, solar arrays to produce energy and much more. By this week the San Francisco 49ers stadium will have installed 1,442 precast panels that form the upper bowl level of the stadium, representing almost 70 percent of the project completed. By the end of February, more than 20,000 tons of concrete will be complete and ready to start the lower level of the field, the lowest seating arrange in NFL stadiums. The 49ers stadium construction features more than 2,000 panels, each of them weighing up more than 35,000 pounds, and the total cost of the new San Francisco stadium will get over $1.1 billion. 2014 Super Bowl: Another Polar Vortex?